Please Join us for Our Fourth Annual Spring B.A.S.H. 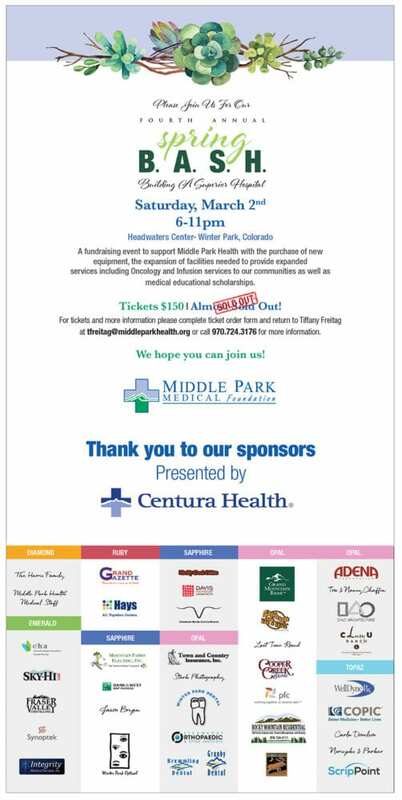 A fundraising event to support Middle Park Health with the purchase of new equipment, the expansion of facilities needed to provide expanded services to our communities as well as medical educational scholarships. Founded in 1991 to provide financial support for Kremmling Memorial Hospital District, the Foundation focuses on connecting our communities by cultivating private philanthropy in support of Middle Park Health (MPH) formally Middle Park Medical Center (MPMC). Today, we continue to fund staff education, community health and wellness programs, and equipment. We continue to seek meaningful ways to support advances in clinical excellence at Middle Park Health. We help advance the work of Middle Park Health by raising the financial resources to help keep facilities and technology first rate, and to help fund programs for patients each year. We are honored by your donations. A healthy hospital is truly the foundation of a healthy community. 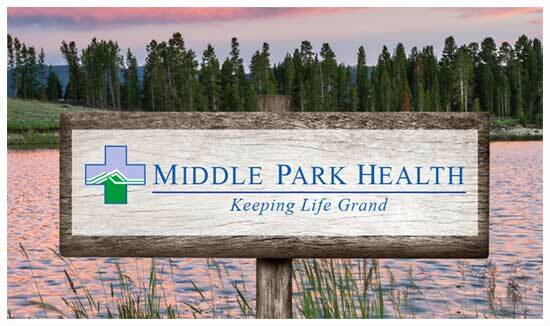 Middle Park Medical Foundation (MPMF) is a 501(c)3 non-profit organization headquartered in Kremmling, Colorado. Our tax-ID number is 84-1594815. $220,000 in grants and donations distributed to our community. 85% of giving to MPH; 15% of giving to other local healthcare needs. MPMF was founded in 1991 by a group of concerned Grand and Summit County residents to ensure the future of the Kremmling Memorial Hospital during a time of financial instability. A fund was established by the Foundation to help restore the hospital to a sound financial position. MPMF has served as the fundraising arm of MPH since its inception. The role of our Foundation is to reinforce the relationship of our communities with our hospital organization by raising funds for programs that advance our hospital’s services, capabilities, and capacities. Giving to Middle Park Medical Foundation is simple. Your gift to Middle Park Medical Foundation impacts the lives of patients and their families. And the benefits of your gifts extend even further by contributing to the health of our communities. Gifts of any size enhance patient care, advance technology and educate staff. Since 1990 Middle Park Medical Foundation has depended upon private philanthropy from our Annual Membership drive to support capital upgrades, education, and professional development. All this is not possible without you. Please continue to support the Foundation with your Annual Fund gifts. Planned gifts to Middle Park Medical Foundation are a way to make a philanthropic investment to support patient-centered clinical excellence and healthy communities even after your lifetime. Your gift enables Middle Park Medical Foundation to continue the legacy of leadership and care for future generations. We can help you find a charitable plan that fits your goals. Please contact Foundation Executive Director or your financial planner to discuss options that meet your estate planning and philanthropic needs. Those who have already included Middle Park Medical Foundation are recognized through the Grand Society.